- Emergency Mobilization broadcast (SMS/Email) feature ensures every recipient in the group acknowledges and receive the message (for Enterprise and higher licenses)*. - Group Level Priority - prioritizes recipients within a Group send - distinct from Priority setting. - Restrict access to Addressbook Recipients and Groups to specific user department. - Login Web Portal (for sending message and emergency mobilization broadcasts)". 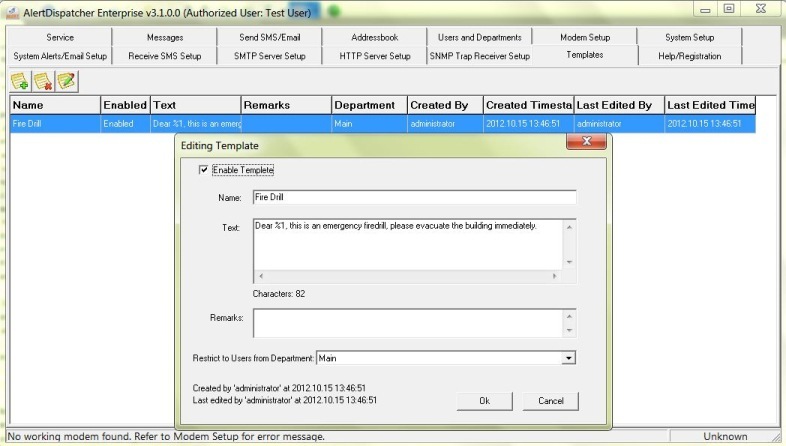 - Multiple enhancements to Client message grid. a. Toggle word wrap for displaying long messages. b. Ctrl-C support for copy and paste of message elements. c. Quick reply from message grid. - Automatically downloads updated Client from server when you upgrade the server". 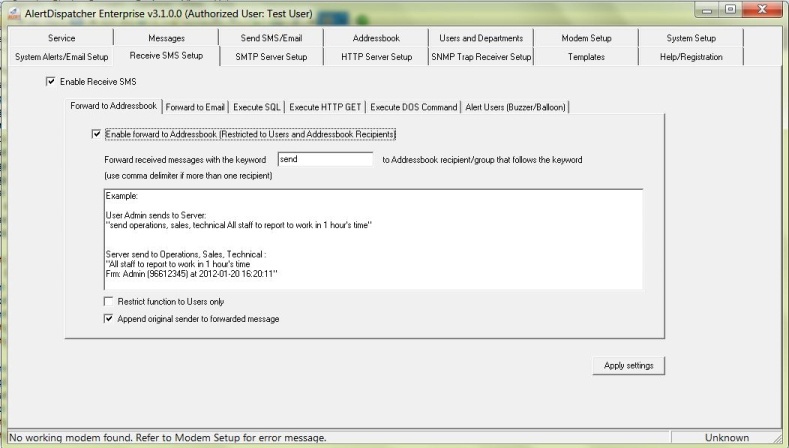 - Message Templates - with option to restrict access to a template to a specific User department". 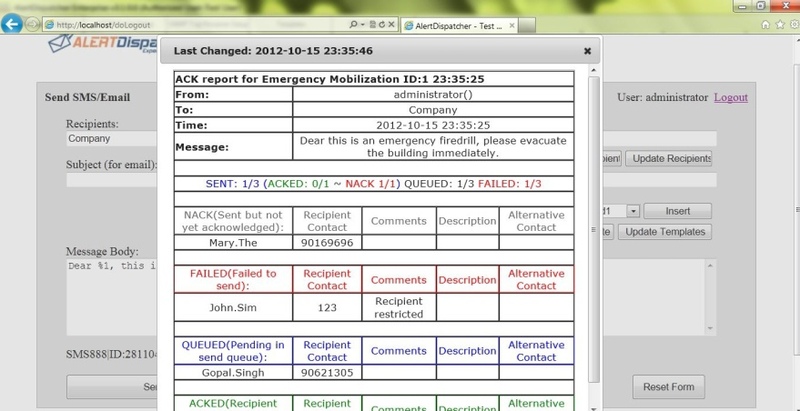 - Configure footer for basic escalation and emergency mobilization messages. - Define "Auto-Response" message for "UNSUB" SMS. - Fixed memory exceptions when client loads too many messages. - Removed option to restrict SMS/Email (send/receive) to Addressbook recipients. - External watchdog service combined with internal thread monitoring for messaging, HTTP, SMTP and SNMP Trap services to ensure high system availability. 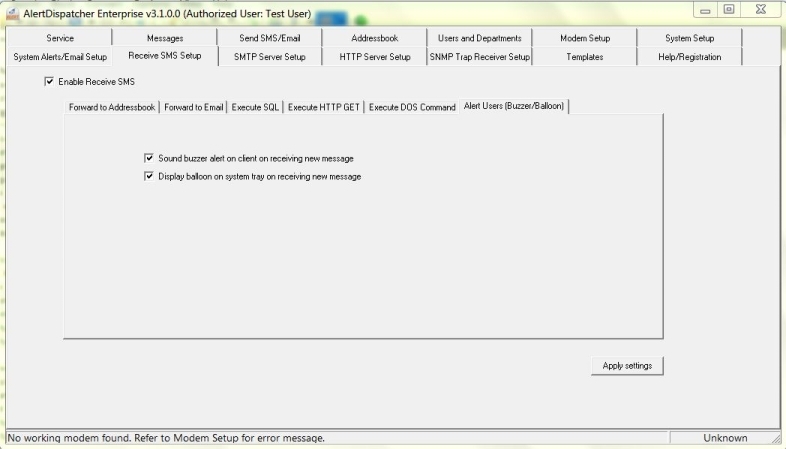 - Sound Buzzer and show balloon on Client on receiving SMS*. - Forward received SMS to addressbook recipients/groups. 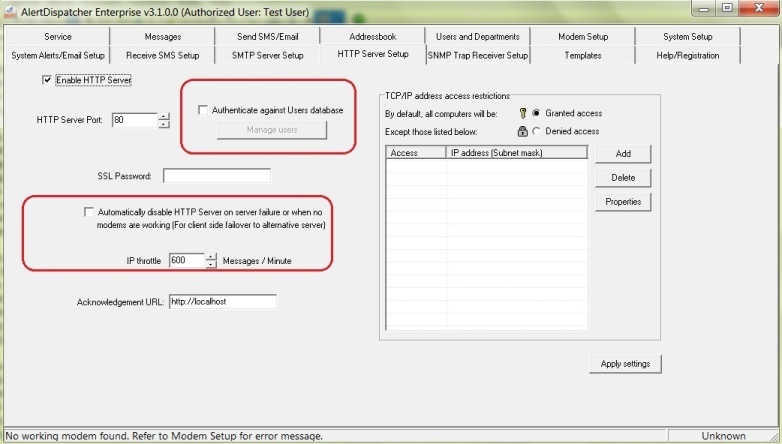 - IP Trottle control for HTTP/SMTP Server - prevents flooding. - Authenticate HTTP requests against Users database. - Specify modem to use for SMTP Server (for Active/Passive Modem Pool - failover to passive only if active fails). 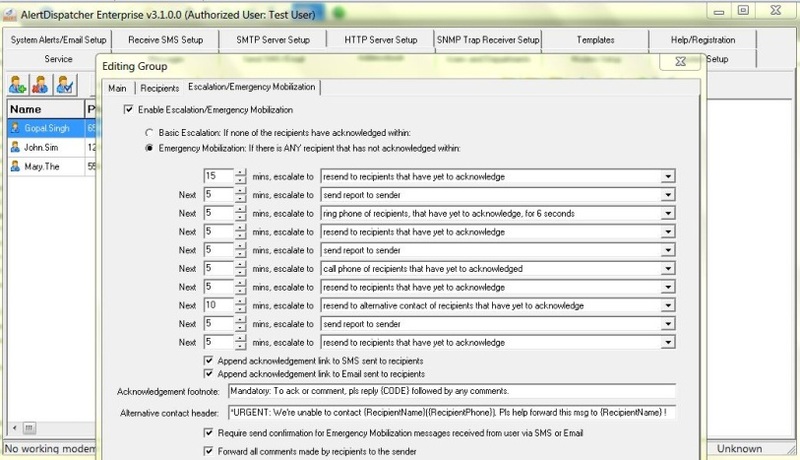 - Option to disable HTTP/SMTP Server on modem/program failure - for HTTP/SMTP Client with a failure over to alternate server capability. 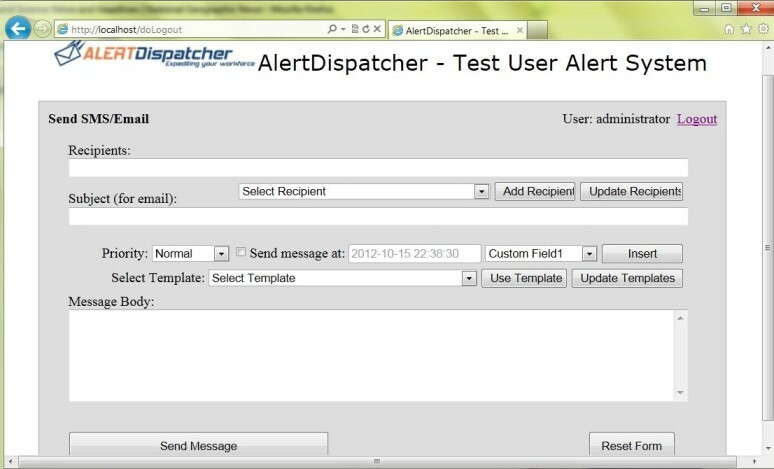 - Multiple methods to initiate broadcast through SMS, Web-login, AlertDispatcher Client or API (HTTP/Email). - Generate automatic SMS/Email progress reports at periodic time intervals. - Remind users to acknowledge via SMS/Email or phone call. - Option to acknowledge via SMS/Web link. 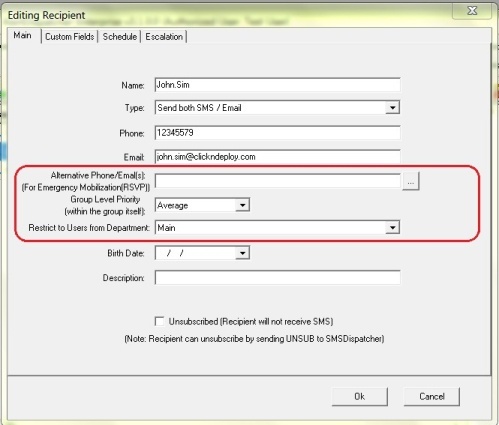 - Option to reach to alternative contact for recipient. Group Level Priority and Restrict access to Addressbook Recipients and Groups to specific user department. 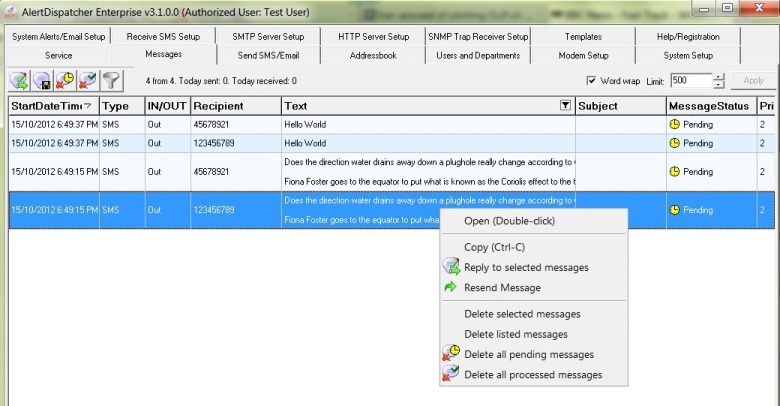 Multiple enhancements to Client message grid. Automatically downloads updated Client from server when you upgrade the server. Forward received SMS to addressbook recipients/groups.